The Email Marketing Software Buyer’s Guide 2016 is the ideal starting point for selecting a new Marketing Automation or Email marketing software vendor. 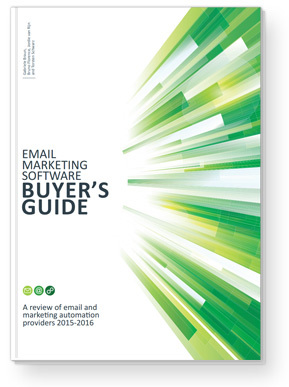 The guide brings together over 400 data points for an analysis of capabilities, services, and product features of 111 email marketing vendors. To understand what your personal best-fit solution looks like, the data is displayed in a side-by-side lookup table that makes it simple to see which products are best suited to your situation and requirements. Brands that order the guide and are currently in a selection can get a complementary half hour discussion with an author or selection expert. The guide has an analysis of capabilities (services / product features) from over 400 data points across 14 topics to help you evaluate and pick the right email service providers and Marketing Automation providers. Once you have selected your favourites, it also has vendor profiles and shows in-software screenshots. The guide is composed by four international experts that guide ESP and Marketing automation selections themselves. Drawing on their practical first-hand experience in the field as opposed to a subjective single man driven evaluation. Together with a secondary team of multi-vendor agency, industry consultants and end-users who reviewed the analysis. Bruno Florence is an e-mail marketing expert. He has published the only dedicated benchmark of French ESPs every 4 years. Bruno Florence is VP of the SNCD, the French direct marketing organization based in Paris. His activities include consulting on email marketing strategies, lifecycle campaigns, and deliverability. He founded the E mail Academy training program and is the author of the Pignonsurmail eCRM Blog. Gabriele Braun, Dipl. Ing of Cartography (FH) and degree in geography, is the Managing Director of the directory marketing-BÖRSE. She has been active as an IT expert for over 25 years. Gabriele authored and has published numerous studies about e-mail marketing and books in the field of online marketing. Jordie van Rijn is an independent marketing consultant. He is the driving force behind the international platform for Email and Marketing Automation Software selection. And author of the bestselling managementbook emailmarketing in 60 minutes and the SmartInsights Marketing Automation Best Practices & technology Guide. He was named one of the top50 influencers worldwide in his field and often asked to guide technology RFPs and as a trainer and speaker in the field of email marketing and eCRM. Torsten Schwarz is one of the leading experts in online marketing in Germany. He is the author of ten books, multiple lecturer and according to the magazine acquisa one of Germany’s pioneers in marketing and sales. Dr. Schwarz is the publisher of email-marketing-forum.de, online-marketing-experts.de and the online directory marketing-boerse.de. The online pioneer was marketing director of a software manufacturer and advises international companies today. His best-selling book “Leitfaden Online-Marketing” is the go-to reference book on that subject in Germany. All reports creators will say they are objective. But the proof is in the process. We feel that all vendors that are invited for the report should be based on their technology and never asked for a fee or other form of payment to be included. While there is merit to certain reports that are pay-to-play, you are never really sure. But show the data points that can be validated and let you select on quantifiable measurements. You will save time and effort and best of all it is affordable: We want you to actually use it. The guide is available in PDF format. The email marketing software guide has the evaluation of email marketing software, and does lists the email marketing services they provide. If you are looking for a pure email agency, and already chose your software, look here for that kind of email marketing company.